The thing about the “opener” strategy is even the Rays couldn’t tell you exactly how much it’s helped. It’s hardly intended to make that dramatic a difference in the box score; it’s about slightly shifting the odds in a handful of matchups. If it didn’t affect the name of the starting pitcher, a strategy like this wouldn’t have made many headlines. But, the Rays knew what they were getting into. They knew that, in a way, they were turning baseball on its head when they started Sergio Romo. 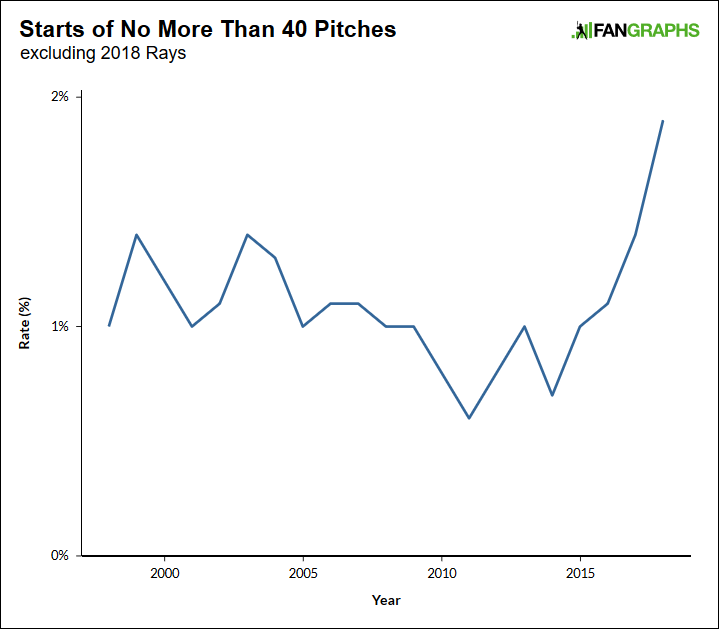 The Rays have stuck with the opener for a chunk of their starts ever since, and the evidence suggests it’s not not working. As far as I can tell, the Rays have started 49 games with an opener. It’s not always easy to tell who’s an opener and who’s just a starter with a relatively low pitch count, but I feel reasonably confident about my selections. Over those 49 games, the Rays have gone 29-20. Overall, they’ve allowed 3.95 runs per nine innings in those contests, which would rank them fifth-best in baseball. They have a combined 14.8% K-BB% in those contests, which would rank them 11th-best in baseball. And remember, that’s pretty good, because the Rays don’t use an opener for, say, Blake Snell. This is what would be the back of their rotation, and the numbers are still easily better than average. 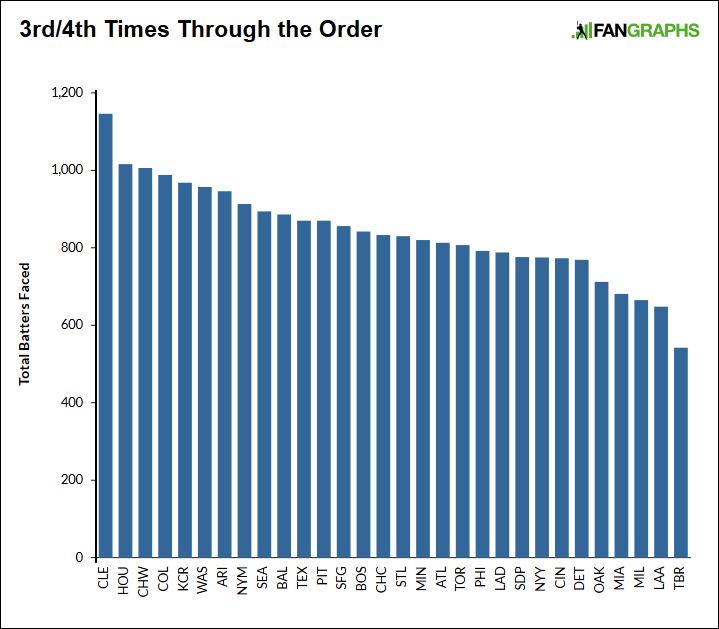 We don’t know how the Rays would look *without* the opener, but the pitchers have pretty much all bought in. At least in Tampa, the opener doesn’t look like it’s going away. The Rays are at the end, separated from the next-lowest total by more than a hundred. Now, keep in mind this isn’t a great thing on its own. The Angels are the next-closest team to the Rays, and they have a low total because their rotation hasn’t been that good or healthy. The two left-most teams are the Indians and Astros, and they have high totals because their rotations have been terrific. The opener only really came about in the first place because the Rays found themselves woefully short on quality starters. They made do, and they found themselves a signature tactic. Or maybe it’s not so signature anymore. The Rays, of course, remain the industry leader in using the opener. But the idea has already spread. The Dodgers tried the opener once. They gave the ball to Scott Alexander. The Blue Jays have used the opener, giving the ball to Tyler Clippard. The Rangers are now making repeated use of the opener. The A’s have taken to opening with Liam Hendriks. The Twins have taken to opening with Gabriel Moya. The Twins, in fact, have gone so far as to implement the strategy in the upper minor leagues. One of the truths about baseball is that competitive advantages can and do exist. Teams all have their own ideas and best practices, and some of those can turn into an edge on the field. But it’s also true that, when promising ideas are exposed or revealed to the world, the competitive advantages can be fleeting. I think the jury is probably still out on whether the opener is even worth the trouble, but it’s no longer an idea that just belongs to the Rays. Other teams have already given it a go, and as for those that haven’t yet, I’m sure virtually all of them have at least had a conversation. When doing bulk research, there’s no easy way to select for openers or opener-like appearances. Here, though, is one proxy, covering the 30-team era, since 1998. For each season, you’re seeing the rate of games in which the starting pitcher didn’t exceed 40 pitches. Obviously, this includes a bunch of games where the starter got hurt. There are also games where the starter was removed because of a rain delay, and there are also games where the starter was removed due to ineffectiveness. 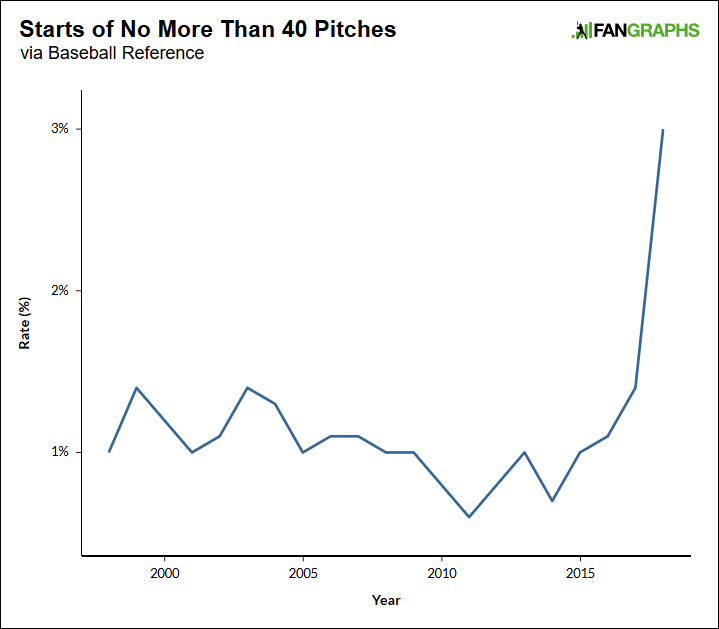 There’s a whole list of reasons why a starting pitcher would be removed quickly, and the noise doesn’t necessarily even out over the course of a regular season or two. Still, 2018 has led to an obvious spike. And the spike is still present even when you remove the 2018 Rays entirely. The increase there is more subtle, but remember, even the Rays weren’t using the opener until the second half of May. The league-wide rate in July was 2.5%. In August, it was 3.6%. So far in September, it’s 7.4%. Even with the Rays excluded, the September rate is 5.4%. I know that September roster expansion allows teams to be more creative if they want, but this is still a surge; last September’s rate was 3.2%, and the rate the previous September was 2.1%. The role of the starter is changing. Or, the role of some starters is changing. We’re seeing more openers, and we’re seeing more bullpen games. The two aren’t the same. They begin the same — a reliever comes out to throw an inning or two. In an opener start, the ball is shortly turned over to the primary pitcher, or the so-called “bulk guy.” In a bullpen game, it’s just a steady stream of one- or two-inning relievers. The Rays didn’t invent the bullpen game concept, and they didn’t even really invent the opener concept, but you can think of the Rays as having granted permission. Because the Rays volunteered to go first, and because the Rays have been successful, other teams are more motivated and willing to play around with the starting-pitcher role. It’s less about designating some kind of traditional starter at all costs. If a starter isn’t available, so be it. And if a starter is willing to enter in the second or third, the Rays have effectively dismantled the wall. Teams are more willing to see what happens for themselves. Once more, it’s not an obviously good thing. It’s just a different thing, a thing worth trying out. Most pitchers seem to be pretty open-minded about it. Which isn’t to suggest it always goes over smoothly. The A’s have experienced a bit of clubhouse grumbling related to the Hendriks games. It’s important for teams to clearly communicate the benefits and risks of toying around with the starter role. And you can see some of the caution in how the strategy has been implemented. It’s not so weird for the designated starter. That’s just a reliever entering very, very early. But the list of “bulk guys” reads something like: Ryan Yarbrough, Yonny Chirinos, Austin Pruitt, Jalen Beeks, Daniel Mengden, Kohl Stewart, Zack Littell, Stephen Gonsalves, Chris Bassitt, Yohander Mendez, Ariel Jurado, Dennis Santana, and Mike Hauschild. Maybe I’ve left off a few, but that’s not a group with a lot of service time. There’s nary a proven veteran in the bunch. The younger and more inexperienced the pitcher, the less likely he is to complain, and the more likely he is to be open-minded, if only out of necessity. All these pitchers want to make sure they have jobs. And so they’ve been willing to do what their teams have asked. Nothing here has to be permanent. Even the Rays might one day end up with five good, traditional starters. There’s a lot left to learn about the opener, there’s a lot left to learn about moving away from normal starts, and some teams might now just be messing around for the hell of it. Every team wants to have a great rotation, one through five. But every team also knows that’s unrealistic, and every team increasingly understands that the traditional way of handling a pitching staff isn’t necessarily the best way. The Rays gave the rest of baseball permission to explore their own space. It’s hard to imagine it’s all just going to go back to how it was. We hoped you liked reading The Gradual Spread of the Opener by Jeff Sullivan! Arbitration is virtually hopeless to keep up with the opener. In theory money just gets redistributed around, favoring the pitchers who have the most important roles, whatever those are, but of course all roads eventually lead to: pay younger players more. I think we have to hope that Arbitrators will step out of the prehistoric age and start rewarding pitchers for their abilities – not for stats that are largely out of their control like wins and losses. Openers were generally non-closer relievers to begin with, so they would not have had many wins or saves anyway. The bulk guys get more wins because they are no longer tied to the 5IP minimum to qualify for a win. So it should only help them in arbitration. And a guy like Stanek can always argue the fact that he’s started almost 30 games this year and can probably better argue to an arbitrator that those innings are somehow more “valuable” than had he put those up as generic late-game innings (although obviously less valuable than saves). You would think the “followers” might get most penalized by it, as they’ll show up with a lot of innings but few starts. But then again, they’ll vulture a lot of wins. Yarbrough is 15-5 on the season with 140 innings – how will those numbers play in arbitration? Does he get treated essentially like a starter, even though he pitched innings 2-7 instead of 1-6? Openers are usually otherwise relief pitchers though, who don’t expect to get many wins anyway. The real questions is whether pitchers frequently used as the “bulk guy”, (pitchers who would otherwise be starters) get more or fewer wins than they would as traditional starters. The fact that Ryan Yarbrough has 15 wins suggests that bulk guys might not be at any disadvantage when it comes to getting wins and hence larger arbitration salaries. I think the bulk guy will get more wins and fewer losses as a result. If the opener gives up a run in the first, the bulk guy can give up 10 runs and not get a loss, but if he pitches well enough for his team to score a few runs, he gets the win. Also, I believe if the starter doesn’t go 5 innings, the W is given at the discretion of the official scorekeeper. As the opener becomes more common, I think the W statistic will become less meaningful to those who still find value it in. Exactly — I think your 3-4-5 guys in the rotation should LOVE this idea: they have a better chance to get a win than if they started. If they started, a progressive team is going to pull them before they go through the opposing order a 3rd time — which means it’s a toss-up if they get the 5 innings they would need for a win. With another pitcher facing the first 3 to 6 guys, they can come in, fact the BOTTOM of the order the 3rd time, and even if they don’t get their 5 innings in, it doesn’t matter: as long as they leave with the lead, they have a good chance to get a win.